And this causes us more stress than we can imagine. “As the time drew near for his return to heaven, he moved steadily onward toward Jerusalem with an iron will” (Luke 9:51 TLB). You and I tend to get distracted by trivial things. I’ve found in my years as a pastor that if Satan can’t get you to be bad, he’ll get you to be busy. And this causes us more stress than we can imagine. In the last few days, I’ve been sharing with you seven principles of stress-free living from the life of Jesus. Jesus’ fourth principle of stress-free living is concentration. You must know what matters most. When light is defused, it has no power at all. But light that’s focused has enormous power. Take the sun as an example. On its own, the light won’t harm grass. But if you focus its light with a magnifying glass, you can burn that grass. Focus light even more and it becomes a laser—and a laser can cut through steel and kill cancer. 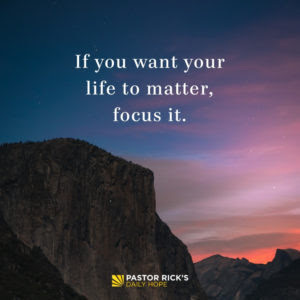 If you want your life to matter, focus it. 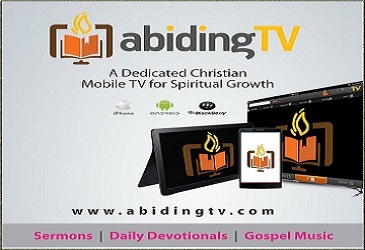 Jesus showed us this in Luke 9:51: “As the time drew near for his return to heaven, he moved steadily onward toward Jerusalem with an iron will” (TLB). You have enormous spiritual power that will only be unlocked if you decide what’s most important to you. You can focus on either what will last for eternity or what is temporary. It’s your choice. You’re free to do anything, but not everything will be helpful. If you don’t concentrate your life on what matters most, you’ll stress yourself out over what matters least. What kinds of trivial matters tend to get too much of your focus? What should matter most to those of us who follow Jesus? What changes can you make in your habits that will help you concentrate your life on what matters most?